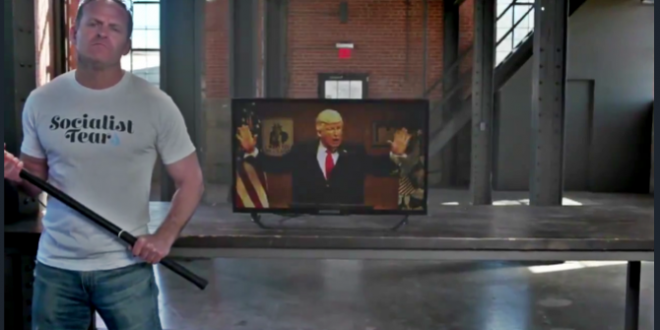 NRA Smashes Own TV Because Something Something - Joe.My.God. Grant Stinchfield — who donned safety glasses for the stunt, just in case the headass-ery got out of control — slammed the TV right as a Morning Joe panel popped on the screen. Another layer of the ad is the host’s t-shirt, which read “SOCIALIST TEARS.” It’s not entirely clear why the NRA thinks destroying their own private property will make socialists cry, but Stinchfield apparently found the approach to be effective as he stared directly into the camera with a defiant, constipated expression. Stinchfield last appeared on JMG when he called on North Korea to nuke California. It’s what Jesus would want.